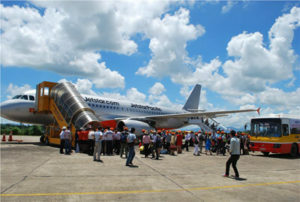 The Airport Corporation of Vietnam (ACV) has begun expansion of Phu Quoc International Airport. Local media reported that once the project is completed it will extend passenger capacity to 5 million annually. The province’s People’s Committee of Phu Quoc district vice chairman, Huynh Quang Hung, was quoted saying Phu Quoc International Airport needs to improve its facilities to attract more tourists. The airport terminal building is already showing signs of congestion. inside no 2“The forecast up until 2020 shows that visitors to the airport will increase to around 2.5 to 3 million, so a comprehensive extension is necessary,” he said. On a daily average, the airport serves 42 flights. The airport initiated its second expansion phase in April 2015, with a total investment of more than USD89.4 million to improve the runway, hangar, passenger terminal and outdoor parking, the report said. For the first nine months of the year, the airport served 1.6 million visitors, a surge of 47.18% compared with the same period last year. Phu Quoc lies around 45 km offshore from Vietnam’s southern province of Kien Giang. It is fast becoming a popular island destination for international tourists and is on the route for cruises from Singapore to Hong Kong. Foreign travellers can visit Phu Quoc for a 30-day visa-free stay. However, they must enter through the island’s seaport, or through its airport, after transiting through Hanoi, or Ho Chi Minh City’s international airports. Currently, Phu Quoc has more than 6,000 hotel rooms. The island expects to have 15,000 rooms by 2020. Kien Giang expects to welcome 6.8 million tourists in 2020, or an increase of 9.5% annually in the number of visitors, including 450,000 foreigners.